Category: Animals & Nature, Girls, Tutus & Accessories. Posted in Animals & Nature, Girls, Tutus & Accessories. Tagged as Fawn Tutu, Travis Designs. 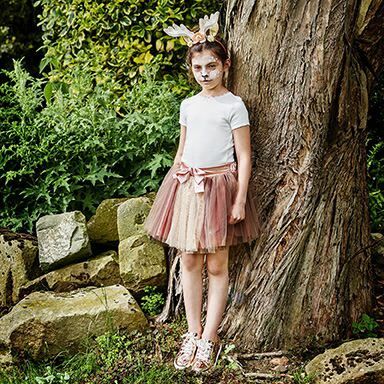 This enchanting tutu set consists of a pretty skirt with layers of soft browns, peach and cream nets with sparkling gold sequins and a soft satin bow.